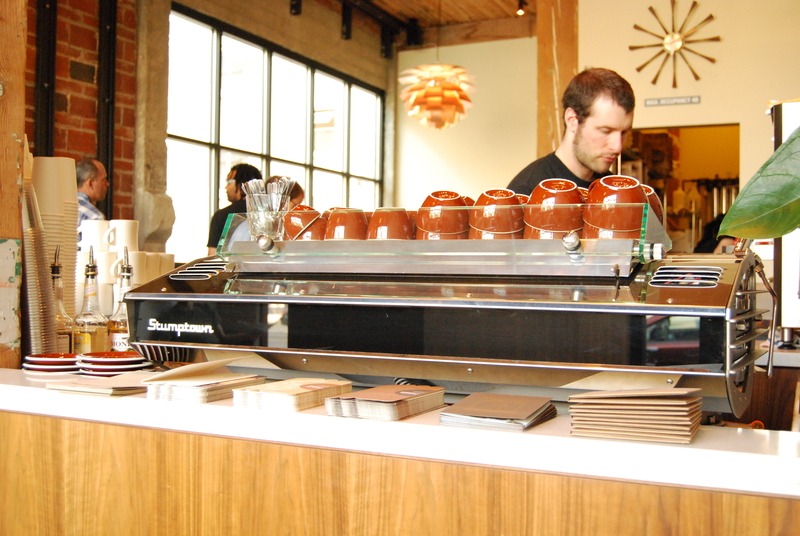 It’s been almost 3 years since Stumptown has opened their beautiful roasting facility and cafes in Seattle. No matter which roaster you work for or which coffee you prefer, it’s undeniable that Stumptown has had a profound influence over Seattle’s coffee scene. Without getting into who’s coffee is better and whatnot, it’s fair to say that everybody has been upping their game for sure. To that, more power to them all. This brings up an interesting question – with the proliferation of 3rd wave coffee, what’s next? 4th wave? What are the parameters of this next stage of evolution? With the way things are brewing (bada bing! ), direct trade and ultra attentive sourcing will result in brewing methods that highlight such extensive work. These may include single origin espresso and single origin coffees by the cup via various methods e.g. pourover, chemex, press pot, etc. Equipment-wise, this means new coffee brewers and espresso machines that enable greater control over soft preinfusion and pressure profiling. Though there has not been an entire industry consensus on merits or standards of soft preinfusion and pressure profiling (whether on a Mechanical Paddle La Marzocco, Synesso, or Slayer), things are trickling in. Advanced soft preinfusion (soft preinfusion with pressure manipulation) in its various forms have shown what’s possible to date. It doesn’t necessarily work on all coffees and, in the end, it’s still in the tongue of the beholder. In words, it’s hella debatable! The results have been impressive for us – espressos tend to be much more softer and rounded, without sacrificing its core delicacies e.g. brightness, acidity, etc. Hopefully, as more advanced soft preinfusion machines (Mechanical Paddle La Marzoccos and Slayer) find their way onto coffee bars, a better consensus can result. However, advanced soft preinfusion is but only an incremental step towards total control a.k.a. true pressure profiling (that is, infinitely variable pressure from zero to your desired maximum brew pressure throughout the extraction process). Whatever the technology (or the lack thereof) that will get an espresso machine there, more power to it. After all, it’s all about what’s in the cup that truly matters. Well, it’s also about reproducibility as well. It’s rather difficult to use either advanced soft preinfusion or pressure profiling to make every espresso shot in a busy cafe. It’s just not practical! To date, no production machine has been able to truly enable true pressure profiling. To that end, La Marzocco is working on a brand new, true pressure profile machine. A prototype was shown at this year’s SCAA on a down low basis and there’s field tests/feedback going on to get maximum input and feedback from those that will ultimately use it. All we can say is, watch out for it in 2010!